Framed Ready to Hang Artwork Size:12"x24"x2pcs+12"x32"x2pcs (total W-48"x H-32", estimated 1"=2.5cm), Perfect Pieces to Decorate Your Room and Reflect Your Attitude to Life,Ideal Decoration Gifts. Premium Giclee Eco-solvent Canvas Prints,Long Lasting Vivid Color Creates the Feeling of Original Nature and Masterpiece.Stretched on Wood Frame,Ready to Hang,Professional Museum Gallery Wrap, Back Finish Neatly. Hanging Hardware Kit Attached,Well Packed in Carton. The Actual Color Maybe Slightly Different Because of Different Brand of Monitors. 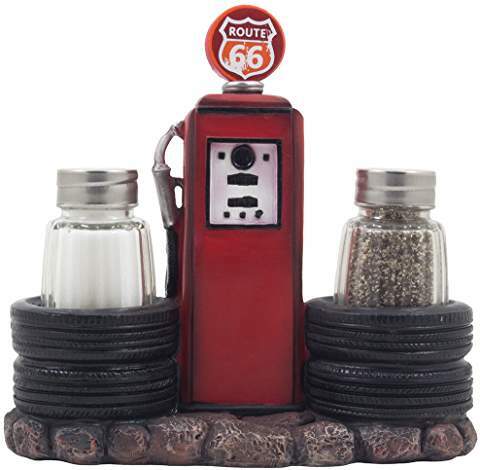 Inspired by old-fashioned Route 66 gas pumps, this Mantle Clock is a fully functional clock that reminds you of the good old days. Do you have an antique picker or collector in your life? They will love this clock! BRUSHED RED FINISH: This well-designed piece has aluminum metal construction with a vintage, brushed finish in a reddish-brown color. The colors and design make it a wonderful gift for an antique sign collector, your husband's garage, or even in your business as a unique conversation piece. CHARMING DETAILS: There is an attached faux gas pump hose and meter that really bring this clock to life. Keep time and have a well-decorated space at the same time! BATTERY POWERED: No cords or chargers necessary are necessary with this mantle clock. A single AA battery is all that is required for it to keep you on schedule. The AA battery is not included.